Like most big cities Dublin is best explored by its neighbourhoods. Google map of the Temple Bar District in Dublin. 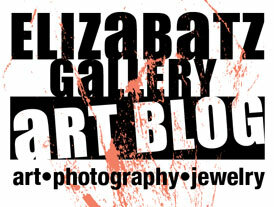 (Click to enlarge.) The recommended Porterhouse Temple Bar is on the far west of the map and John Gogarty’s on the far east. In between are a mass of overpriced, touristy pubs (at least according to the many chatty locals we met); a couple of small but interesting galleries; and the Pieman Café Al’s #1 favourite restaurant in entire Ireland. 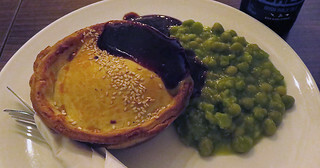 Chicken Leek Pie and Mushy Peas at the Pieman Café in Dublin, Ireland. I had to cut my planning map for this area in half as it was way too wide for my blog. Map A consists of a few not so far-flung sights; we walked to the Museum of Modern Art and its gardens from our B&B near Arthur’s but never made it to the Gaol, Hurling Grounds or Phoenix Park. Map B butts up to the east of Map A and consists mostly of pubs I would highly recommend (we did make it to these although not all in one day). 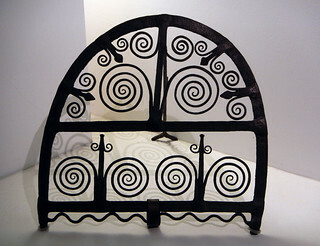 There is the free National Museum of Decorative Arts with all sorts of daily life stuff like this wrought iron fireguard full of spirals. The Guinness Storehouse is also in the district. It is a tad pricey but worth it even if you’re not crazy about Guinness beer. We got the Early Bird tickets online – they were cheaper and the tour bus crowds didn’t arrive until about 11:30. I see that the Christ Church Cathedral and Dublin Castle are also in the vicinity if you run out of things to do between the many pubs. Pubs in this area that I have written about include Arthur’s (fabulous seafood chowder and decent prices) and The Black Sheep and L. Mulligan Grocer (both with an excellent choice of craft beers and L. Mulligan Grocer is a gastropub). 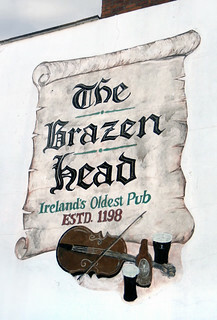 ‘The Brazen Head’ is also on this map and tops several lists of interesting pubs in Dublin including the oldest pub in Ireland, best music venues in Dublin and literary pub, well worth a stop. Google map of Dublin showing the National Botanic Gardens (free and fabulous, often with accompanying shows! ), Glasnevin Cemetery next to it (also free, highly recommended by my neighbour Roxanne who went on a tour of famous personages of the city who are buried there) and the pub John Kavanagh’s, in Victorian times a hangout for grave-diggers! (Irish Central’s top five historic pubs in Dublin City.) It’s a little bit out of the centre and the only area of the city that we took the bus to get to. 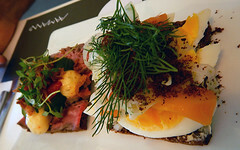 This took the better part of a day but left us time for some pub-hopping in the evening closer to our B&B. Glasnevin Cemetery. Google Map of Dublin showing Trinity College, the pubs we visited on the Literary Pub Tour, St Stephen’s Green and two more free National Museums that we didn’t make it to. A sculpture by Henry Moore of the Irish poet W.B. Yeats in St Stephen’s Green. More on our 2015 trip to Ireland.